One particle physics conference ends and another begins. After Toronto, the next one is Physics In Collision 2010 starting tomorrow at Karlsruhe . Access to slides of the talks can be found here. Further results from ATLAS and CMS will be presented tomorrow, and with the rapid increase in data collected there is always a chance that new plots will appear not seen in Toronto last week. 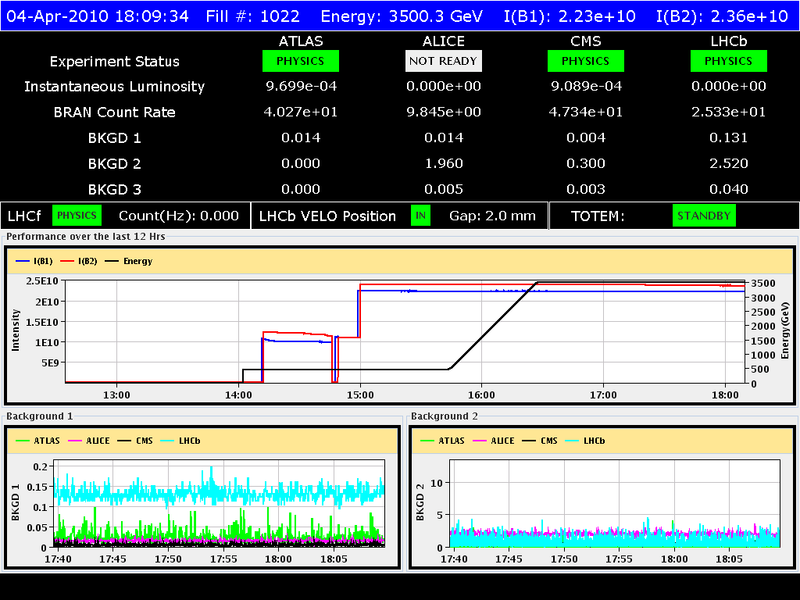 These LHC experiments now have 3.6/pb of data collected. New negative results are possible. However, it is unlikely that they will show any results with positive hints of new physics because it would take longer to check and approve anything that exciting. Speakers face a little dilemma at these conferences because they need to upload their slides in advance, but they don’t want to spoil the talk by showing their results in advance, especially if there is a risk that someone might blog about it. 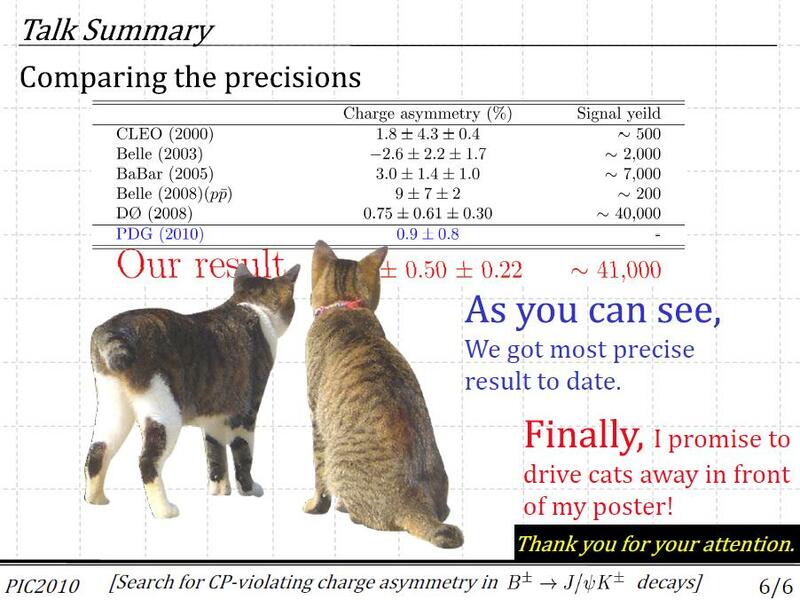 One poster presenter has tackled this problem by allowing some cats to wander in from hid critical result. If you are going to try this technique, don’t forget that it is possible to extract images and text from PDF even if they are hidden by overlays. 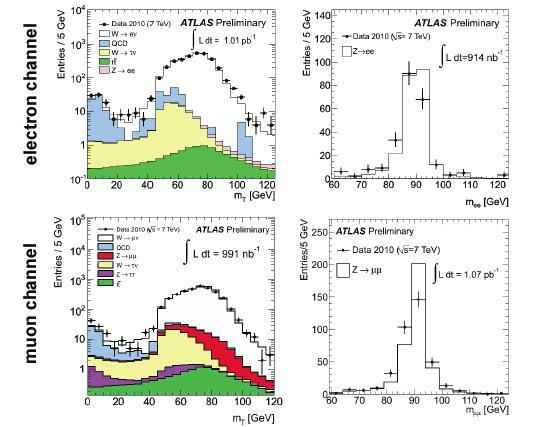 New results from the LHC at Toronto. 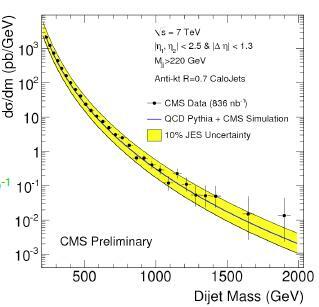 It’s less than a month since we saw results from the Large Hadron Collider presented at the ICHEP conference and we marvelled that they were able to show the analysis from 350/nb of luminosity collected just a few days before the conference opened. But ICHEP is not the only conference worth watching and now they have about 2200/nb (2.2/pb) of data with much of it collected in the last week. At the Hadron Collider Physics Symposium in Toronto this week more new results are being shown. 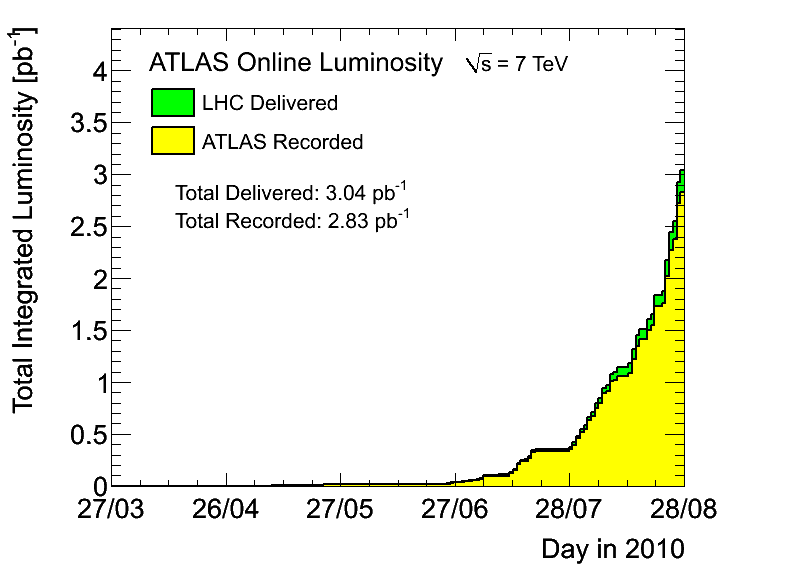 Some of it using over 1/pb of data or about three times what was seen at ICHEP. Sadly there are no videos of the talks but the slides are being put online and I hope that some of the more expert particle physics bloggers will soon be able to tell us some details of what has been presented. 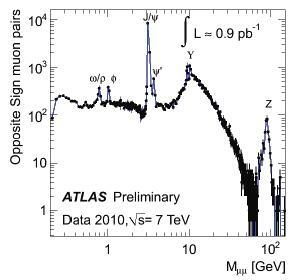 From a talk today by Corrine Mills on W and Z physics at ATLAS we have this nice update to the beautiful plot of muon pairs showing some classic resonances very clearly. This is using 0.9/pb of data. I can’t help thinking they have cut the x-axis off a bit shorter than necessary. What lies just above the 100 GeV energy range shown I wonder? More plots using over 1/pb appear at the end of the slides. I don’t think there is any new physics here but it’s just nice to know that some results from the first 1/pb have come out so quickly. It is only 16 days since they passed that milestone. 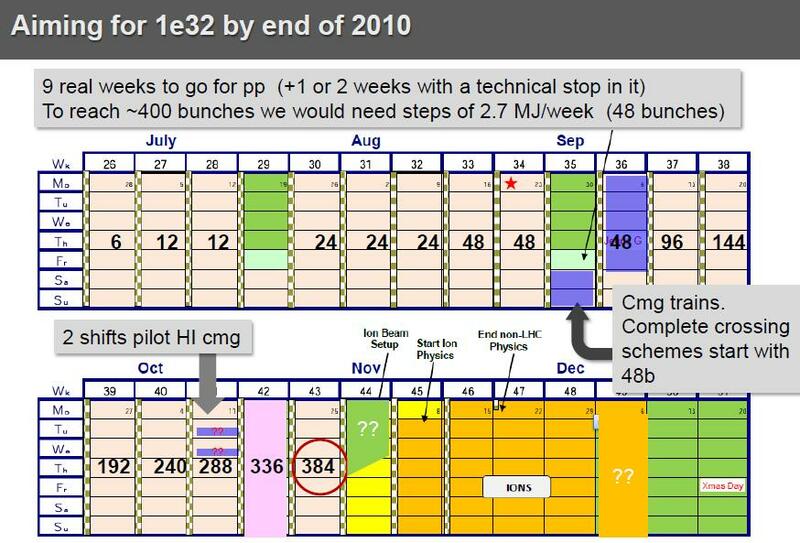 ATLAS have really thrown the gauntlet down for CMS who only showed plots using 200/nb in their talk on the same topic. Tomorrow they will present top physics and Higgs searches with Beyond Standard Model stuff and heavy ion physics the day after. On Friday they conclude by looking to the future, including the possibility of LHC upgrades and the case for keeping the Tevatron running. Startling announcements are not expected but it’s worth watching just in case. 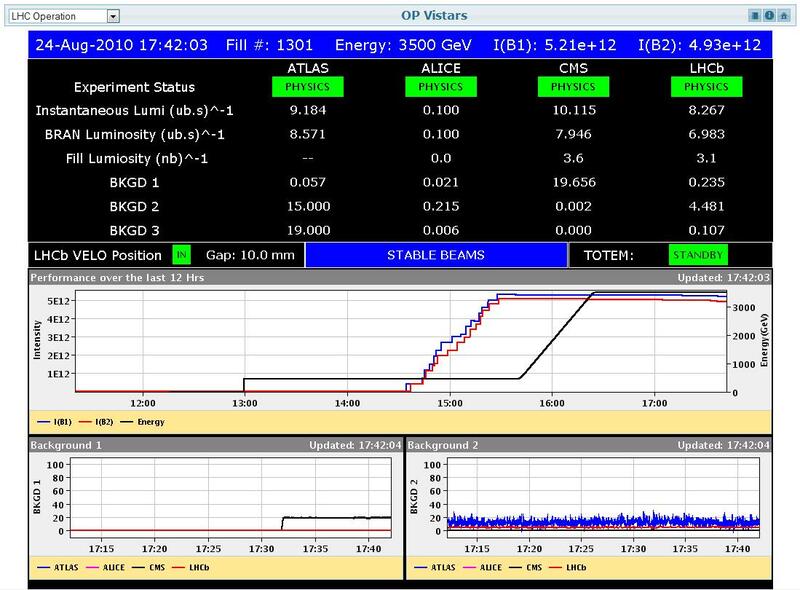 The Large Hadron Collider has passed a new luminosity milestone with a peak of 10.1/μb/s ( or 10.131 Hz/cm2 or 0.32/fb/year) recorded in the CMS detector. This was achieved at the start of a run with a new filling scheme using 50 proton bunches per scheme today. This figure is one tenth of the target luminosity for the end of this year that is needed to get them ready for collecting 1/fb during 2012. Can nuclear decay rates change with solar flares? Following a news article from Stanford, slashdot has followed up with a report on observed changes in decay rates of radioactive elements caused by solar flares. This is not really new and follows other claims that nuclear decay rates change by about 0.1% on an annual cycle (or other longer cycles corresponding to various forms of solar activity) of course Motl has reported it two years ago. The explanation for the effect offered by the scientists involved is that it is caused by changes in neutrino fluxes from the Sun. There are small variations in beutrino flux of this sort but the effect on deacy rates seems unlikely because neutrino interactions as we know them are too weak for this to happen. It would have to be something far outside the standard model that has somehow avoided detection in very sensitive experiments such as Super-Kamiokande. If not neutrinos then the next suggestion is some as-yet-unknown particle. It is an appealing idea but it is still unlikely that something like that could affect nuclear decay rates without being observed in different ways in other experiments. Could the effect be caused by something more basic such as changes in electric or magnetic fields or even temperature in the environment of the experiment? If such dramatic effects on decay rates could be caused in these ways it would have been observed in controlled experiments a long time ago, so this can be ruled out. Environmental effects on the measuring apparatus are another matter, so suspicions immediately arise. 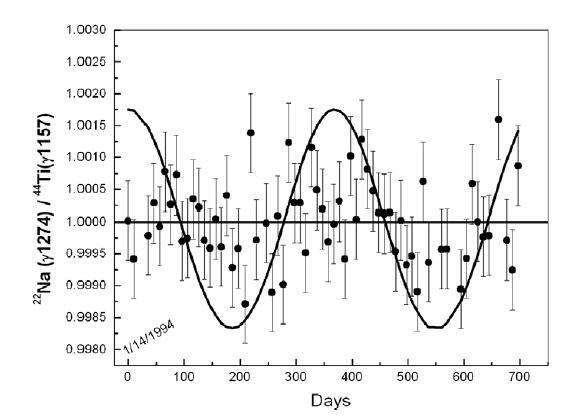 Putting aside the solar flare result for the moment, it turns out that someone has already done some more careful experiments to look for annual variations of decay rates and found nothing (See Evidence against correlations between nuclear decay rates and Earth–Sun distance) here is one of their plots. I have chosen the one that looks like it comes closest to showing some effect to my eye but it is nowhere near the claimed effect shown by the sine curve and is not statistically significant. Could there be some effect seen better with solar flares? The trouble is that solar flares are relatively brief. One claim was for an effect that lasted 43 minutes. The studies of annual variations were performed over a period of two years and still the statistical errors are just a little below the expected effect. If solar flares caused an effect observable over 43 minutes it would surely have to be much larger to stand out from the noise. Sadly then, the warning signs are not aligning in favour of these results, but ruling out an effect conclusively might require more experiments. You are currently browsing the viXra log blog archives for August, 2010.